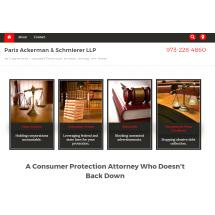 If you are a victim of consumer fraud, our team at Paris Ackerman & Schmierer LLP can help you. Our law firm offers comprehensive representation for consumers who have suffered as a result of fraudulent business practices. Starting with the free initial consultation and following through any appeals or questions down the road, our attorneys are a constant source of support and advocacy for our clients. We have earned a reputation for protecting the rights of consumers, having brought class action lawsuits against some of the largest corporations in the country who had engaged in unlawful business practices. This includes situations involving unlawful overcharging, false advertising, bait and switch scams and similar instances of fraud against consumers. We help our clients seek justice, and we will help you bring a claim against those who have harmed you. Each of our clients can expect clear communication through every phase of his or her case. At Paris Ackerman & Schmierer LLP, we prioritize prompt responses to clients' concerns, instilling the confidence and clarity necessary to move forward. We will use every resource at our disposal to ensure that we reach the best possible resolution to your case. Our law firm serves clients in New Jersey, New York and Philadelphia.